An Over-Killer is a soft-clipping limiter barrel to let you get more level on your digital copy by limiting the level of a balanced analogue signal to +18dBu. The OVER-KILLER, with its unique super soft clip circuit, stays soft even when large overloads are present and does not become hard like less sophisticated systems. The clip level is carefully set so that peak modulation is very close to the nominal maximum level. Many similar units lop off up to 1.25dB when switched into a circuit. With the flexibility of having the OVER-KILLER as an external unit, A/D input sensitivity can be separately trimmed to push even closer to peak code. 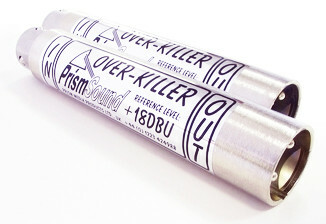 OVER-KILLERs are supplied as a set of two XLR barrels suitable for use with balanced stereo analogue signals.